Radiator Stop leaks are the best solutions if you want a temporary solution for leaking problem of your radiator. For instance when your radiator begins leaking during you are on a long drive or any camping trip and there isn’t any workshop nearby. 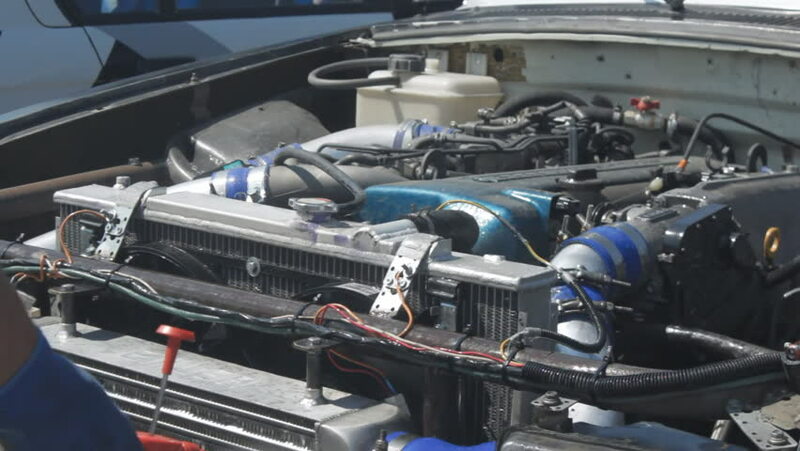 You cannot take the risk to drive without any appropriate cooling system. Here you can take help of radiator stop leak to solve this leaking problem and allow yourself to take your car to the nearest auto shop and get fixed your radiator leak problem. Radiator stop leak are available in the form of powder, tablet or liquid and work pretty much the same. They tend to create a coat at the holes and prevent water or fluid in the radiator from leaking. Do they really work to stop the leakage? Definitely they do! But not for long because eventually you will need to have a permanent fix to your radiator leak problem and take your vehicle to an auto workshop for this. Many professional may even think or suggest not using these temporary radiator leak solutions any way. The bit of reasons behind this is their business and stake, however the true reason is that not many of us are known to the proper directions to follow and we can fill more than suggested quantity. In such situation it can even block your entire cooling system and it can even damage your engine. To conclude this you must keep best radiator stop leak with you for only emergency situations because it is just a temporary fix, just like the spare wheel and it is only to help you take your vehicle to a workshop. 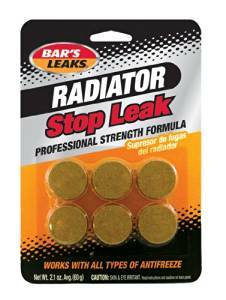 Here are the reviews for 3 best radiator leak stop solutions. AlumASeal is best for those who are looking for water pump conditioners. Whenever your radiator leaks with following signs like yellow or green color fluid or running hot engines, or you have to refill your radiator constantly you can directly pour the AlumASeal in radiator tank of your car. It will find all the fractures inside your radiator to fix the usual wear. It then seals all these leakages and fractures by its only one of its kind formula which is safer to use with each and every kind of coolants and antifreeze and all cooling system types, whether it is made up of metal, plastic or rubber. AlumASeal is very easy to use and apply. Just make sure your engine is cool, then turn on the heater, fill in the amount (mentioned on the package) of sealant, simply drive the car. We like AlumASeal because we feel it performs well. After sometime you will experience very less fluid leaking from your radiator. Again it isn’t a permanent solution, it will still allow you to squeeze just few thousands or hundreds of miles from this and then you need to delay the trip and take your automobile to the workshop. AlumAseal also contain water pump conditioner. The antifreeze is often not sufficient to guard all types of plastic, metal, and rubber inside the cooling system as well as not strong enough to save them from corrosion. Water pump conditioners can lubricate the thermostats and water pump seals to prevent the corrosion and rust inside the cooling system. 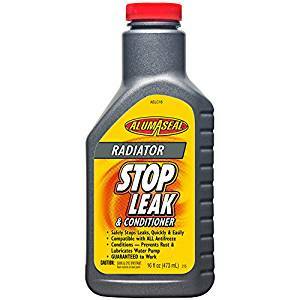 All in all AlumAseal Radiator Stop Leak & Conditioner Liquid is best for radiator leakages for those who want both, the best stop leak plus a water pump conditioner in one. 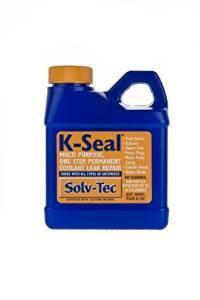 If you want something that gives you the versatile solutions for car leaking problems, go for K-Seal Multi Purpose One Step Coolant Leak Repair. It not only works for leak problems, it can also fix the problem of leaking head gas kits, engine block, and water pump. It can get mix will all kinds of antifreeze as well as it needs no draining or flushing. It is very easy to use. Just shake it well and pour into the radiator. An eight oz container is enough for cooling of twenty quarts. We appreciate K-Seal because it can simultaneously work to solve the leakages in other parts of your vehicle, such as leakage in head gasket. There aren’t any worries because its uniquely formula will never react with the anti-freeze; therefore it would not damage anything. We have tested all the other radiator stop leaks and AlumASeal performance was found to be on the top. You will feel the real difference before and after its application because antifreeze dropping will be pretty well stopped. As it is ideally not a permanent fix to radiator leaking issues, technically it can be used several times once your radiator begins leaking again. 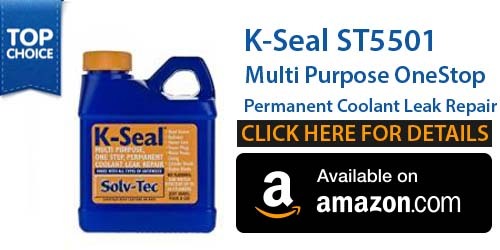 Overall, K-Seal Multi Purpose One Step Permanent Coolant Leak Repair is best for those who want an all rounder solution to car’s leaks problems. Bar’s Stop Leak is best for those who are looking for a solution that is portable, cheap and easy to use. A packet of Bar’s Stop can be carried in the gloves compartment and can be used by simply throwing one or two of its tablet inside the cooling system of your car. It similarly works with almost every kind of radiator’s fluids and protects against corrosion and rust inside the cooling system of your car. We like Bar’s Stop because with this you don’t need to be worried about carrying a large jar of liquid. Also with the liquid type of stop leak, there is a chance of overfilling. However with tablets in a pack of Bar’s Stop you can easily and carefully measure the required quantity by dropping them one by one. As these tablets are not as good as its liquid counterpart, but this difference is very small and it is the best exchange for convenience. In no doubt, it is another temporary solution but it is good to carry one pack of these useful tablets to avoid problems while driving in a place where you cannot find any auto workshop and you find yourself helpless with overheating engine. In a nutshell, Bar’s Leaks HDC Radiator Stop Leak Tablet is one of the best solution for temporary fixing your radiator leaks problem at the cost of fewer bucks and fewer efforts. Bar’s Leaks G12BP-7PK Radiator Stop Leaks Powder – 0.75 oz. We all know how frustrating it is when you drive out your car and see puddle of liquid on your driveway. This puddle will leave a horrible stain on your driveway pavement as well it is a sign that something is really wrong with your vehicle. Most if not all car owners will think that this leak means a costly fix, however that does not have to be the case. Most people should have access to cheap, easier to use products that are used to stop radiator leaks or seal the coolant tank. For this reason Bar’s Leaks Radiator Stop Leak Powder are designed. It is small technology packed in a tube which is ready to stop minor leaks in your car’s radiator or cooling system so that you can manage to get your car back on the road. As compared to taking your automobile to a dealership or garage and spending labor and parts to fix that minor leak in your radiator, you have a ready to use solution within your hands. This solution won’t break your bank and it is very easy to use. There are millions of particles in this powdered formula radiator stop leak and with these particles you permanently seal the leaks in aluminum, plastic and metallic radiators, freeze plugs and heater cores. For most if not all vehicles, this formula stop leaks in just few minutes. Bar’s leak has a team of professional chemical engineers who are always busy in finding better ways for solving the leakages problems. They are always behind ready and quick fixes at lowest cost possible. And the best part that there are no worries because you can use it with all types of coolant including, orange, pink, blue, red, yellow, green silicate type and non-silicate types (HOAT/OAT) antifreeze as well was water based. 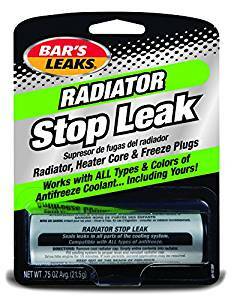 This radiator stop leak seals all types of leak, condition your car’s cooling system, inhibits corrosion and rust, lubricates your cars water pump seals and helps to control electrolysis. 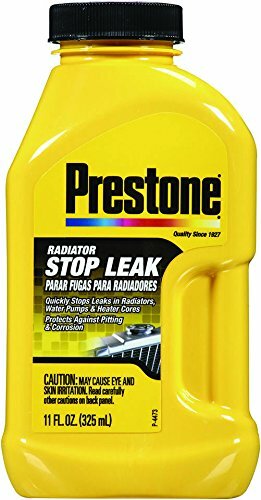 Prestone AS145 Radiator Sealer Stop Leak – 11 oz. Preston AS145 Radiator Stop Leaks is another patented formula which quickly stops leakages in radiator s, heater cores and water pumps and at the same time also protect your car parts from corrosion and pitting. Prestone AS145 Radiator Sealer Stop Leak takes sealing performance to the highest level by stopping leakages as well as corrosive condition which causes the leakages in first place. The unique blend of synthetic and natural components in Prestone Radiator Stop Leak Sealer gives the ability to seals the leaks up to 0.020 inches x 0.5 – particles just like you have seen in some bullet proof jackets. Prestone Stop Leak particles have been selected to seal some larger leaks without interfering with flow by radiator as well as the heater core tubes. Prestone AS145 Radiator Sealer Stop Leak also improve corrosion inhabitation in order to protect your car parts against corrosion and pitting.